Tax season has come round again in the US and Canada, and with it no shortage of scammers looking to exploit unsuspecting taxpayers and the government. In this article, we’ll cover some of the latest and most common tactics used by fraudsters, then explain how to keep them at bay. The US Treasury Inspector General for Tax Administration has received 736,000 reports of people being contacted by scammers between 2013 and 2015. In that time period, about 4,550 taxpayers lost $23 million to scams. As tax scams get more advanced and more common, those figures are sure to grow. Our focus is on tax fraudsters who target legitimate taxpayers to steal their money or to steal money from the government using the taxpayer as a proxy. Fraudsters may contact you through the mail, email, or by phone, so be alert on all fronts. Almost all tax scams rely on impersonating an authority figure to make victims pay up. This video demonstrates a fairly typical phone scam to give you an idea of what to expect, though some scammers will be more convincing than others. This is one of the oldest tricks in the book, but fake audits are apparently still effective enough to be worth fraudsters‘ time and effort. The scammer contacts the target claiming to represent the IRS or CRA. They state that a recent audit identified discrepencies in your tax filings, and immediate payment is required. The fraudster will often make threats of additional fees, jail time, and deportation to spur the victim into making an impulse decision to send the money. Once the victim is sufficiently compliant, the fraudster provides instructions for sending the money. This might be a bank transfer, wiring service, pre-paid card, gift card, or bitcoin. This scam is fairly easy to pull off because it doesn’t require the scammer to know much about their target. Emails can be sent out in bulk, and the initial phone calls can be automated so that scammers only need to interact one-on-one with those who respond. Even if only a handful of people fall for the scam, the ease of conducting the scheme makes it worthwhile to fraudsters. In this scam, fraudsters prey on people expecting tax refunds. Victims receive an email, text message, or automated phone call posing as the IRS, CRA, or a taxpayer advocacy group. The message states the target has a refund pending and they can claim it on the tax agency’s website. A link is provided where the taxpayer enters their personal information, which will likley include a Social Security Number (or SIN number in Canada) as well as banking info. The link provided directs the victim to a phishing site. It looks official but is actually a forged copy of the real IRS or CRA site. Once the victim fills in the form and submits it, no refund is ever issued. Fraudsters now have enough information to steal the victim’s identity. Sometimes these websites harbor malware that can infect your device and steal information or worse. Like the audit scam, phishing for victims with fake refunds as a lure is an easy scheme to pull off. Most people will not be tricked, but a few will, and that’s all the scammer needs to make it worth their while. The newest and perhaps most convincing scam in the fraudster’s playbook deals in erroneous refunds. It’s a much longer and more targeted con than the other scams in this list. Identity thieves start by targeting local tax preparation agencies with hacking attacks and phishing attempts. Once the tax agency has been compromised, fraudsters use its customers‘ information to file phony tax refund requests. The IRS processes the return and deposits money into the agency clients‘ accounts. That’s phase one. Phase two starts after the deposit has been made. The fraudster contacts the people who just received the erroneous refunds and demands they be paid back. The fraudster often poses as a tax collection agency working on behalf of the IRS. 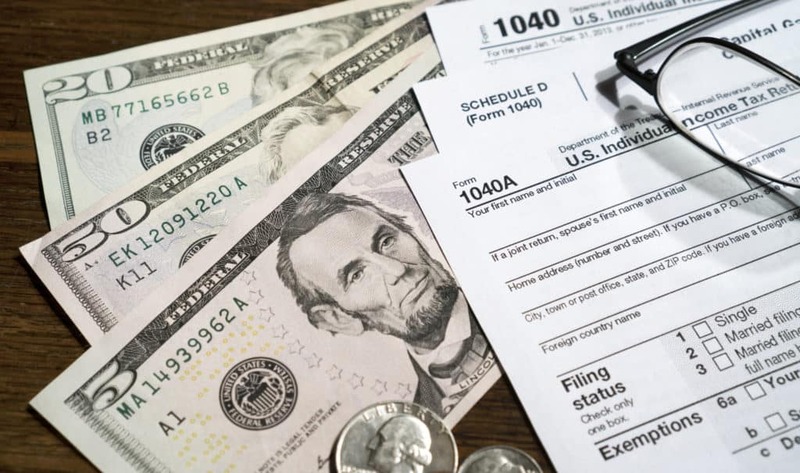 Victims are instructed to wire money to the fraudster, leaving them both without a refund and possibly in trouble with the IRS for filing a false refund request. This scam is particularly effective because, due to the information that the scammer gleans from the compromised tax agency, they have access to your private information including your name, Social Security Number, address, bank name, routing number, and account number. Having all that info on hand makes the scammer seem much more credible. Furthermore, the fraudsters in at least one case used the website of a real but defunct tax collection agency. Anyone who looked up the agency would then see a real, registered business. The website looks legitimate but is really a phishing site where victims enter payment details and send scammers money. Even if you don’t fall for the scam, the fraudsters still have victim’s banking details and Social Security Numbers, so anyone affected should take steps to prevent identity fraud. Tax protester schemes don’t have any direct financial incentive for the fraudster. It’s more of a troll than a scam, but can still be costly to victims. The consumer receives a message via phone, email, or text stating that they are not required to pay income tax. The fraudster makes some sort of cloudly legal argument as to why the victim is exempt, often entailing some argument about a natural person versus a legal person. The goal of a tax protester is to convince other people not to pay their taxes. Failure to pay taxes can lead to fines and even jail time, so don’t heed their words. Avoiding tax scams requires a skeptical mindset anytime anyone approaches you asking for your personal information or money. Sometimes it can be difficult to distinguish between the real IRS and a fraudster, but knowing the warning signs and taking a few steps to verify the other party’s identity will keep you safe. Until you are 100 percent certain that the caller or sender is from an official tax agency, do not give up or even confirm any personal or financial information. In almost all cases, the IRS (US) and CRA (Canada) use old-fashioned mail to contact customers. If you owe taxes, they will send a letter to your mailbox first. If someone claiming to be from the IRS sends and email or text message, it’s probably a scam. Government tax agencies don’t use email, SMS, or social media to contact taxpayers. The IRS and CRA won’t call your phone and demand immediate payment without sending a bill in the mail first. You should be able to question or appeal the amount that you owe. The IRS and CRA will never make threats of arrest and will not ask for your credit or debit card numbers over the phone. In the old days, it was difficult for criminals to reproduce official letterhead and logos, but in today’s world doing so requires very little effort. Don’t be swayed by emails and letters just because they contain official-looking IRS logos and letterhead. Even phone numbers can be faked with caller ID spoofing. The caller ID that appears on your phone when you receive a call can make it seem like the real IRS is ringing you. They may also use IRS titles and fake badge numbers. Scammers often request payment in a form that’s untraceable to law enforcement. This might include a prepaid credit or debit card, gift card, money wire service like MoneyGram or Western Union, or even a cryptocurrency like Bitcoin. If the caller requests payment in a specific form, then it’s almost certainly a scam. Real government tax agencies will have multiple payment options available and allow you to pay how you want, including credit cards, debit cards, and bank transfers. Phishing websites are often designed to look just like the real IRS or CRA websites. Their aim is to trick you into entering private information, which is then used to steal your money or identity. However, these fake sites in all likelihood won’t have a valid SSL certificate. If you are directed to a website supposedly belonging to the IRS or CRA, check the URL bar for HTTPS. At the top of your web browser, you should see a green padlock icon with https:// at the beginning of the web address. This means two things: your connection to the site is secure and the owner of the site is who they say they are (they have a valid SSL certificate). If there’s no HTTPS or the padlock icon is shown in red, then you might have landed on a phishing site. Do not enter any information and exit the page. If at any moment you suspect that you could be a target of a scam and aren’t sure whether some correspondence from an official tax agency is legitimate or not, put on the brakes. Close the web page, hang up the phone, and don’t give any personal information. Call the IRS or CRA using the numbers on their official website and ask if the letter or phone call is real. You can also confirm if and how much you owe. If you think you owe taxes in the US, call the IRS at 800-829-1040. If you don’t think you owe taxes, you can call the Treasury Inspector General for Tax Administration (TIGTA) to report the call as a scam. More on reporting scams below. In Canada, most people will want to call the phone number for individual tax enquiries at 1-800-959-8281.
Letters sent by the IRS always contain a phone number to call at the top right of their letters. Before calling, you should cross reference this number with those posted by the IRS online. Reporting scams is a proactive way to pay it forward by helping law enforcement track down scammers and protect your fellow citizens. Report instances of IRS-related phishing attempts and fraud to the TIGTA at 800-366-4484 or use their impersonation scam reporting web page. The IRS website has forms and phone numbers for reporting all types of tax fraud-related activity. You can also report phone scams to the FTC via the commission’s complaint assistant and add „IRS telephone scam“ in the notes. Report scams to the Canadian Anti-Fraud Centre. Call 1-888-495-8501 or use the Fraud Reporting System by logging in with your GC key or banking credentials. If a scammer caught you with your guard down, what you do next depends on what information you divulged to them. If you shared persional information, such as your social security number and/or other personal details, you are at risk of identity theft. Contact each of the credit bureaus in your country to place fraud alerts on your credit report. This will require you be notified anytime someone accesses your credit history in the next 90 days. If you’ve shared financial information, such as bank account details or a credit card number, contact your bank to place alerts on your account. Consider replacing your cards and opening a new bank account. Monitor your credit report and accounts diligently over the coming months. See our guide on what to do if your identity has been stolen for more help. Tax scams in the past primarily targeted the elderly, immigrants, and people who speak English as a second language. Those groups are still especially vulnerable, but these days everyone is a target. We hope this guide can help keep you and your family safe from scammers.